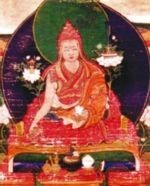 Jamyang Khyentse Wangpo Incarnation Line — Jamyang Khyentse Wangpo was the body incarnation of Jikmé Lingpa, the great revealer of the Longchen Nyingtik cycle. For Jikmé Lingpa's other incarnations see Jikmé Lingpa Incarnation Line. Namkhai Norbu Rinpoche, La Lampada che rischiara le menti ristrette, 1999. Jamyang Chökyi Wangpo (1894-1908/9) as the body emanation of Jamyang Khyentse Wangpo. He was installed at the residence of the first Khyentse at Dzongsar Monastery but was also a close disciple of the Fifth Dzogchen Rinpoche. He died of illness in his sixteenth year. Jamyang Khyentse Chökyi Lodrö from Kathok then took his seat and became the Second Dzongsar Khyentse Chökyi Lodrö. Jamyang Chökyi Wangchuk (1910-1963), the yangsi of Jamyang Chökyi Wangpo, was enthroned again at the age of five at Dzongsar Tashi Lhatsé. Khyentse Yeshe (b. 1970), the son of Namkhai Norbu Rinpoche was recognized by H.H. Sakya Trizin as the reincarnation of Khyentse Chökyi Wangchuk. ↑ This incarnation was recognized by the Fifth Dzogchen Rinpoche. ↑ Pakchok Dorje (1893-1943), the eldest son of Tokden Shakya Shri, was also recognized as a mind emanation of Jamyang Khyentse Wangpo. Kunzang Drodul Dorje (1897-1946) of Dza Palmé (Nangchen) aka Palmé Khyentse Kunzang Drodul of the Drikung Kagyü lineage. Öntö Khyenrab Chökyi Özer (b.1889), according to Namkhai Norbu Rinpoche and Khandro Dorje Paldrön. Lobzang Dorje, a Gelugpa lama from Amdo, according to both Jamyang Khyentse Chökyi Lodrö and Dilgo Khyentse Rinpoche. ↑ Identified as the reincarnation of Guru Tsewang by Dzongsar Khyentse Chökyi Lodrö. This page was last edited on 1 January 2012, at 22:57.